Ahhhh the Double Wedding Ring quilt...it's so romantical. Looking for the next great love story? Delete that Netflix tab, because you have come to the right blog post. 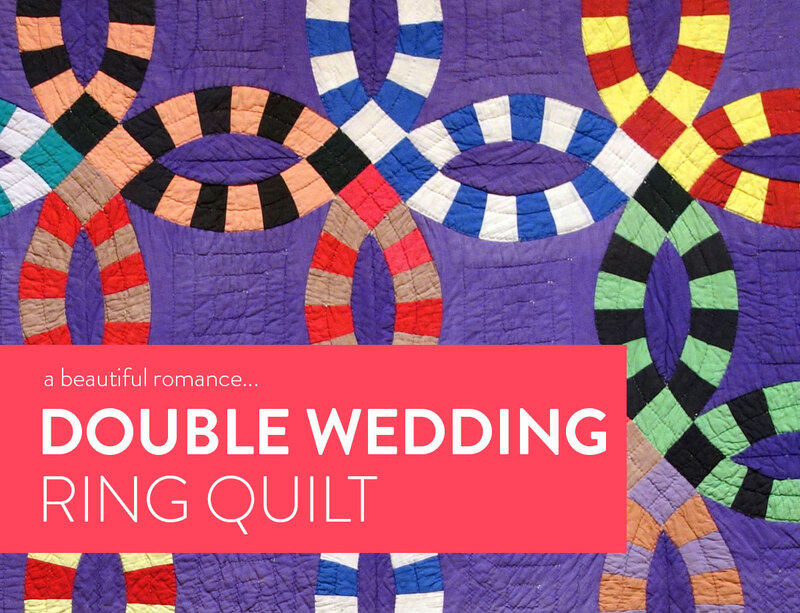 We’re about to dive into one of the most romantic quilt patterns ever: the Double Wedding Ring Quilt. We find ourselves in the midst of our country’s Civil War, searching for hope amidst all of the pain and sorrow. We happen upon, as we often do, an old woman in a well-worn rocking chair, diligently working on her latest project: a quilt for her niece’s wedding. But the movements of her hands and the lines of her face are laced with worry and grief, for the wedding had recently been delayed. The woman’s niece had recently received word that her beloved fiancé had been wounded, and was in a far-away hospital recovering from his injuries. No one knew how long the young woman would have to wait before her soldier was well enough to return to her and exchange vows. While the niece’s days were filled with restless anticipation, her old Auntie had an idea. The day finally came for the soldier to return home, and he was met with a loving embrace and joyful tears. He planned to be wed that day to his patient beloved, but alas… he had no rings. “My child, I’ll furnish the rings,” said the old Auntie, her voice shaking but strong. “You shall have this quilt, and we will call it the Double Wedding Ring.” The two were married, and slept beneath the quilt every night, the warmth reminding them of the promise made to each other, and the richness of their love. Have you ever heard of anything more romantic? And this is why the Double Wedding Ring Quilt has become such a popular pattern, and has been used for special occasions FOREVER AFTER. Over the years the Double Wedding Ring quilt has lost none of its charm. With new modern variations popping up everywhere it is continuously being made and remade anew. The Double Wedding Ring quilt block isn’t the quickest or easiest block, so prepare yourself for quite a project, but you can do anything in the name of love! You can even sew curves. Yes, you. The traditional Double Wedding Ring quilt block has a variety of piecing options and methods, and you may even want to try a few out before getting started on your final quilt. 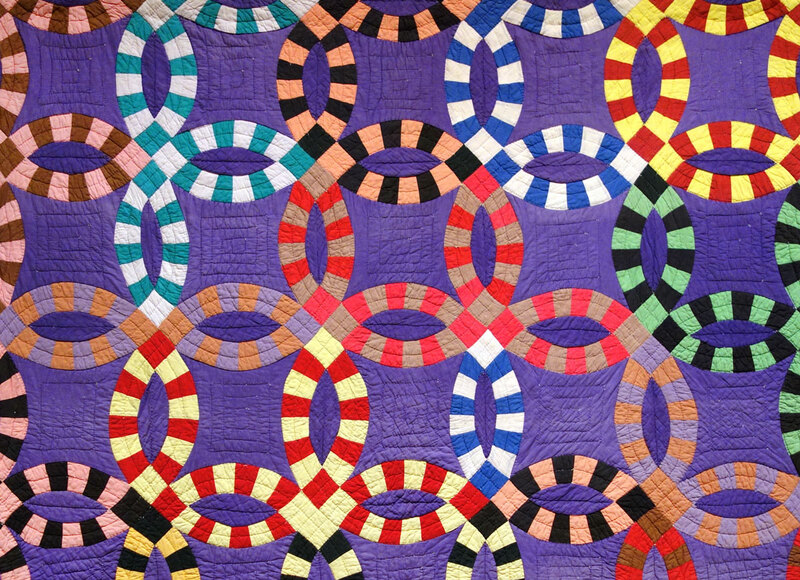 Though the quilt block does require a higher quantity of one solid color for most patterns, the “ring” section leaves considerable opportunity to use up some scraps. If you want to get totally scrappy (and totally inspired), take a look at the jaw-dropping work of Victoria Wolfe. This girl. 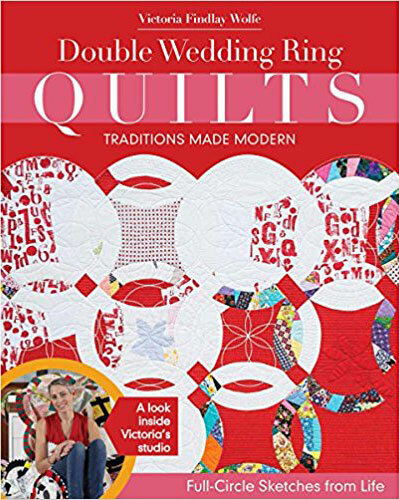 The things Victoria Wolfe has done with the double wedding ring quilt pattern are crazy cool, so it’s no wonder she’s won awards… and written a book. Another amazing Double Wedding Ring quilter is Tara Faughnan. I remember this quilt veeeery well because it came in second place in the hand﻿work﻿ category at QuiltCon 2016 – beating my Mod Mountains quilt that came in third. Tara, I can't even be mad. This quilt is the definition of stunning. Oh, what’s that? You want to get started on a Double Wedding Ring quilt immediately? Yeah, me too. Because I love quilting, and I love love. If curves are super scary to you, I have a couple YouTube videos on sewing curves for beginners. Each one accompanies a quilt pattern too! Such a beautiful story! 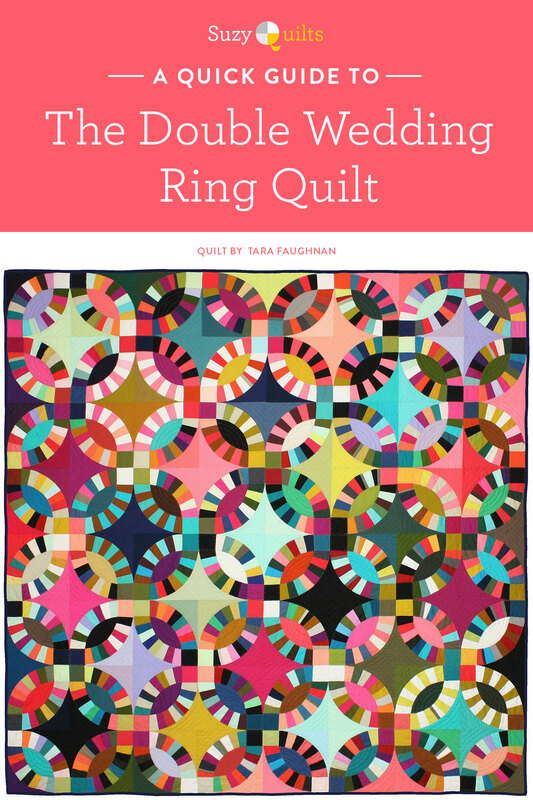 And, who doesn’t love a double wedding ring quilt?! I have one that is over a 100 years old on my bed now and it’s what inspired me to start quilting! Thank you for sharing this story! My grandfather has a Double Wedding Ring Quilt that he helped his grandmother make when he was a little boy. He had to thread the needles for her because she was losing her eyesight. It is such a treasure! I love the image of your grandfather as a little boy helping his grandmother sew. I can picture it now! LOVE this post and story!! Love learning the story behind quilts!! My son is getting married in January – I might just have to make them a Double Wedding Ring quilt!! Love this post! My husband and I have been on our honeymoon in Hawaii and found a local quilt store that sold a pattern for the Hawiian version of the double wedding ring quilt. This post makes me even more excited to try it out! I love hearing the stories behind these age-old quilts! 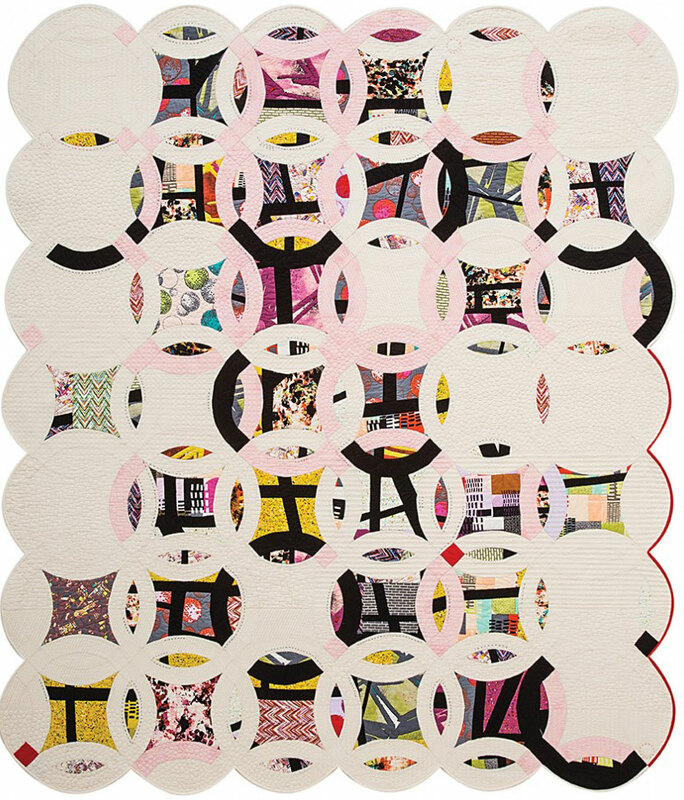 Would really like the pattern for Tara faughan’s quilt. Any reference? Not on her site. I would suggest emailing Tara about that. I have a double wedding ring quilt that my mom made my husband and I for our wedding, and it is my favorite thing that I own, and my favorite version of the pattern that I’ve seen!